Although the tetrapharmakos is not completely feasible, this blog is an attempt to make it true and feasible. The apparent paradox above demands further explanation. When I say that it is not feasible, but even so I will persist on it, what I have in mind is that I am not directly endeavouring to convince anyone that gods should not be feared. Many systems of belief have done precisely the opposite of what they proposed when trying avidly to change attitudes and thoughts. Much evil blossomed amid desperate attempts to establish touchstones of what should be judged as goodness. My chief interests concern solely acquiring knowledge, questioning, and enunciating rational argu ments. The outcomes of these, I believe, may sow upon us the principles of the Tetrapharmakos. In searching the scientific amorality and trying to bring it to Philosophy, our conclusions can get rid of contamination by our wishes and our model of the world can be disinfected from naïve hope or despair. Furthermore, we can possibly meet a wise resignation to the indifference of the universe, a lively beholding of nature not subservient but respectful to its strength. 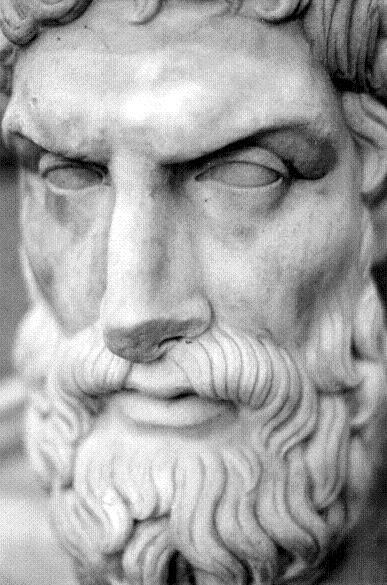 Epicurus inspires healthy mental attitude, for he embodies a man who awakens and sees himself as a rational simulacrum; who sees Nature not as a benevolent mother, nor as an evil stepmother, but as an inert cradle at the same time comfortable and uncomfortable. And yet, a perceptive mind, that uses multiple hypotheses and probabilistic intuition to try and explain phenomena and impressions, who has a sympathetic attitude towards other minds, and that expurgates the daily triviality giving rise to a succession of spectacular events. This philosophical attitude, a by-product of a way of thinking and not a holy grail worthy of thirsty craving, allows the relief from fears of death and gods, and a new way to endure pain and enjoy happiness – this one also a by-product, not a coveted jewel.